Allergy or hypersensitivity is a reaction of our immune system in response our body's contact with harmful allergens. Anti-allergy medications are commonly used for preventing and relieving allergy symptoms. Allergy or hypersensitivity is a reaction of our immune system in response our body's contact with harmful allergens. Anti-allergy medications are commonly used for preventing and relieving allergy symptoms. 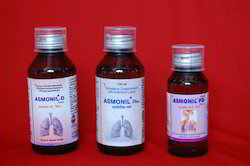 Our range of anti allergic and expectorant drugs is widely appreciated for effectively countering allergic symptoms. Allergies are often caused due to exposure to allergens that are present in the environment, in the form of pollens, grasses, flowers, house dust, mites, feathers, fungal spores and many others. These allergens release Histamines that causes allergic response which are countered by our anti allergic compounds. Our range of Anti Allergic & Expectorants provides relief from varied manifestations like itching, sneezing, rhino rhea, urticaria etc.